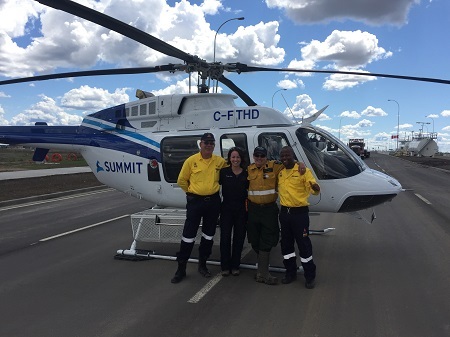 Since May 1st, Summit Helicopters crews put in an overwhelming number of hours and effort towards fighting the forest fire that devastated Fort McMurray on May 3rd. Since first dispatched, Summit’s Bell 407 and a Bell 412 have been working under contract with Alberta Forestry, with over 450 hours of flight time between the two aircraft from May 1st to July 4th. AMEs and Pilots from all Summit locations assisted in the operation, on a very intensive flight schedule. These teams typically work on two-week on two-week off rotations, with the local Fort McMurray Summit Helicopters Base Pilot, Heather Pelley, working on a three week on, 10 day off rotation. When the fire first started, the main role of the Bell 407 (C-FTHD) was “Initial Attack” while the Bell 412 (C-GCCD) has been used for bucketing and crew moves. Our Summit Helicopters 407 was the second helicopter to arrive on the Fort McMurray wildfire on May 1st – dubbed “The Beast” – and was tasked with dropping crews on the ground, followed by the pilot filling and dropping water using the Bambi Bucket as shown in the above photo. This bucket, which holds approximately 180 gallons of water and weighs roughly 1800 lbs when full, can be used to fight multiple fires in one day depending on priority, and, if the water sources are near enough, can be filled and dumped up to 150 times in an 8 hour shift, the maximum allowable flight time for one pilot each day. Once the fire became a “Campaign Fire”, the crews were assigned to the fire full time, with the Bell 407 for Air Operations and Assessment. The Fort McMurray fire became a Campaign Fire when it grew so large that the Province took over control of the fighting efforts, setting up a command base strictly dedicated to fighting the fire. Multiple teams were employed in the efforts, new bases were set up, and dedicated air traffic controllers worked on the ground to ensure the organization and safety of all aircraft involved. Checking on the crews that were dispatched throughout the fire-line are Summit’s Heather Pelley, an Alberta Forestry Branch 1 Manager, and two of the South African crew leads. On July 5, 2016, the status of the wildfire was changed to “Under Control”, which signifies the hard work put in by all the thousands of ground and air crews who worked on this fire as it grew to a whopping 584,000 hectares. Since then, however, many more small fires have broken out north of Fort McMurray due to lightning storms, and they are being contained. Our 407 then went back on Initial Attack in the Fort McMurray district while the 412 continued to help keep fire MWF-009 under control. Both the 407 and 412 are the fastest in their category, which makes them very advantageous in fire-fighting and crew moving. The dedication and commitment of the Summit crews, as well as all the crews that flew in from across the province and country, cannot be understated. Day after day these crews are on the ground, working tirelessly to keep each other and the communities safe, all the while committing to the task at hand. Demonstrating the Summit spirit in everything they do, these teams illustrate how a combination of passion, talent, and opportunity in the workplace can make real, positive impacts on timely issues, and they serve as inspiration for others to pursue their own passions. We’re proud to have each one of them as members of our True Blue Team and congratulate them on their efforts and impact on the Alberta wildfires this season. We would also like to extend our appreciation to the administrative team at our Kamloops location, who rose to the challenge, along with our pilots and flight teams, to ensure smooth and effective operations during the times of increased burden.